Watch Out for Those Beady Eyes Floating Above the Waterline! Float through a mangrove canal brimming with crocodiles! 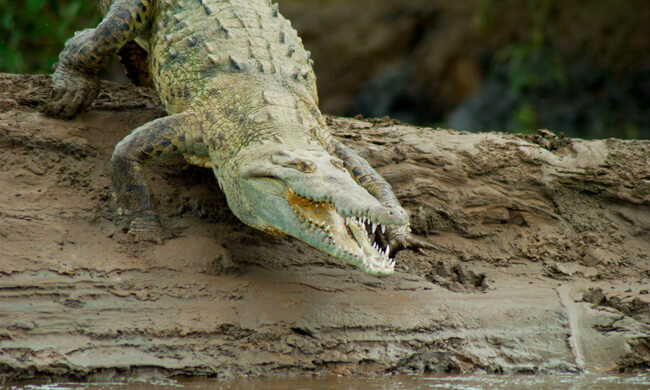 The Tarcoles River is famous for its six-meter, 20-foot crocodiles, and your captain will lead you to the best locations so you can get close (but safe) contact with these giant reptiles! Another perk is that you’ll be touring the diverse ecosystems within Carara Biological Reserve, a unique combination of tropical dry forest and tropical rainforest that gives life to such rich biodiversity. While riding down the murky river, your guide will share with you everything there is to know about the American crocodile. Learn where they live, hide, eat, and sleep, and why they are so famous in this region. There will be plenty of photo ops! You’ll also be amazed by the 1400 species of plants and trees that surround you, including an abundance of scarlet macaws: this national park is home to one of the largest populations of wild scarlet macaws in the country. Carara is also a shelter for approximately 56 other types of birds, so sit back and enjoy this adventure! The tour is recommended for anyone who appreciates wildlife and has an adventurous spirit (not for the faint-hearted). This tour is also available in a combo with visiting the grounds of Carara Biological Reserve (at an additional cost). There are three one-mile loops that you can enjoy at your leisurely pace before doing the river cruise. Inquire with your Travel Consultant for more details! Your tour includes: Transportation, bilingual naturalist guide, water, juice, park entrance fees. What to bring: Binoculars, camera, insect repellent, sunglasses, hat, comfortable clothing, sunscreen, walking shoes.